If my gums bleed when I brush, do I have a problem? Yes, swollen or bleeding gums can be a sign that you have gingivitis or gum disease, the number one cause of tooth loss for Australian adults. We recommend you contact Apple Dental to make an appointment, so that we can examine your mouth and recommend the right treatment. Could I be a candidate for a dental crown? Dental crowns can be a great solution for people who have teeth with extensive decay, chips, cracks, or other heavy damage. This is because dental crowns give good support to your teeth, while they restore their appearance and give you back a complete and natural looking smile. Does a toothache mean I need dental treatment? Persistent toothache may be a sign of a serious underlying oral health problem. We advise you to schedule an appointment with Apple Dental Lane Cove immediately, to allow us to diagnose any issues with your teeth. To relieve pain in the meantime, gently clean and floss your teeth to ensure they are free of any trapped food particles. Over-the-counter pain relief such as Panadol can also help. Is teeth whitening safe for my teeth and gums? Yes. All our Apple Dental teeth whitening treatments have been safely used for many years. We have taken care to only use methods which have been clinically proven to be safe for your teeth and gums, when professionally carried out by our Apple Dental team. When should I have teeth whitening? If you are thinking about having your teeth whitened, we invite you to come into Apple Dental to discuss your situation and options first. If you’re having a tooth restoration such as a crown, bridge or implant, we suggest you have teeth whitening first, so that we can easily match your new artificial tooth’s colour to the exact shade of your whitened teeth. Are white fillings a better choice than amalgam fillings? Some of the advantages of composite white fillings include their beautiful, natural appearance; the way they help strengthen your tooth and prevent breakages; and their ability to provide ‘insulation’ for your teeth and reduce their sensitivity to different temperatures. What do I if a tooth is knocked out? Time is critical, so get in touch with Apple Dental urgently. Be careful to only handle your tooth by its crown – never the root. Gently rinse the tooth in milk, and store it in your mouth next to your cheek. Do whatever you can to get to Apple Dental within 30 minutes, to give your tooth its best chance of being successfully re-inserted. If you have extreme pain or toothache, the cause could be an infection or disease of your tooth’s inner pulp. When left untreated, this pulp and your tooth nerve will die, forming an abscess that can destroy your jaw bone and causing major problems. With root canal treatment we will remove this diseased pulp tissue, helping your body’s defence system repair the damage, and saving your tooth. Rather than the type of brush, it’s your brushing technique which is most crucial in ensuring your oral health. But because technique is not quite as critical with an electric brush, most people find it easier to get better results than with a manual brush. I have healthy gums and look after my teeth, but have recently cracked a tooth. Why? Chewing on or biting hard objects like pencils, nuts, ice or hard lollies, as well as bruxism, can all cause a cracked or broken tooth. If you have old-fashioned amalgam fillings, you’ll also be at much greater risk of a cracked tooth. Unfilled teeth or teeth filled with modern resin or ceramic fillings are much stronger and less prone to cracking. We welcome your questions on any aspect of dentistry. 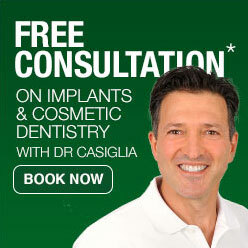 Please feel free to email or call the Apple Dental team on (02) 9420 5050.